ALAMEDA, Calif. – The 14th Naval Zone of the Mexican Navy hosted military unit tours, professional exchange visits and some spirited sports competition for the crew of the U.S. Coast Guard Cutter Boutwell during a recent two-day port visit to Puerto Chiapas, Mexico, Sept. 5-6. Boutwell’s crew was welcomed by Capt. Pedro Gabriel Pineda Berdeja, 14th Naval Zone chief of staff. The first day’s events included visits to the 14th Naval Zone headquarters, 36th Military Zone headquarters, and a tour of city hall with the Mayor of Tapachula. 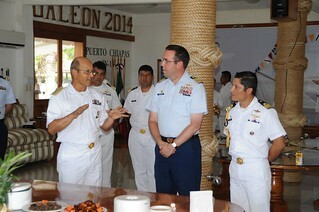 The day concluded with a reception attended by Boutwell crew members and Mexican Navy officers hosted by 14th Naval Zone Commander Vice Admiral Francisco Ramon Tiburcio Camacho. The second day’s events included tours of the Puerto Chiapas Search and Rescue Station, Tapachula Naval Air Base and concluded with soccer and basketball games between the U.S. and Mexican sailors. The home teams dominated the soccer competition while the visiting Coast Guard squads fared better on the hardwood, but the overall objective of building camaraderie between the services was achieved. The two naval forces regularly cooperate on search and rescue missions, use similar equipment to accomplish their missions, and coordinate plans and operations to combat illicit drug trade and human trafficking. “The Coast Guard and Mexican navy work together every day to protect our citizens from the threat of transnational criminal organizations, improve our search-and-rescue processes internationally and maintain a security and safety presence along the borders,” said Capt. Ed Westfall, commanding officer of the Cutter Boutwell. “Visits like this one help strengthen our bonds of cooperation and allow us to share best practices in a more informal setting. I truly appreciate the hospitality of our hosts for providing such a valuable, rewarding and relaxing stop for my crew,” he said. Boutwell’s stop in Puerto Chiapas came near the end of a 88-day patrol of the Eastern Pacific Ocean and international waters off the coast of Mexico and Southern California. Click the photo for more from the visit.